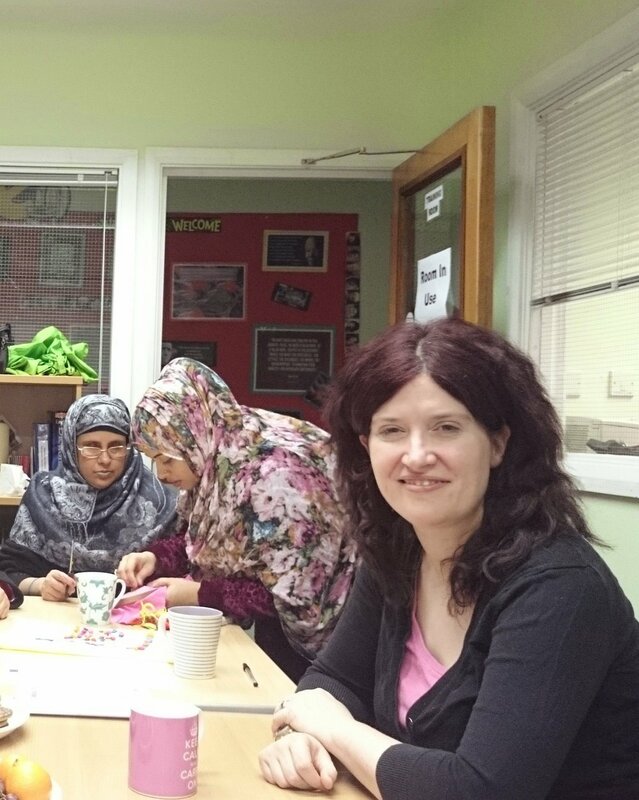 I popped down to Hyde Community Action to volunteer at one of the many groups they run. It was a creative group where women learn various crafts together. The group is so creative that they don’t let spelling get in the way of their creativity and have named their group Kreative Kraftz. I arrived before the group began to help set up and met Hasina who had already laid out some biscuits and fruit on the table. She told me that the members of the group were doing embroidery and showed me a box full of materials, thread and needles. Hasina had started out as a volunteer and now was an employee. Two volunteers arrived; Liza and Syeda and they spoke to Hasina. I asked what language they were speaking and they told me Bangla. Hasina apologised but I told her it didn’t matter I was just interested. The ladies attending the group started to arrive. Hasina explained that the group members made their own hot drinks in the kitchen. In my various volunteering so far I had made the tea as the volunteer. I realised that it must be very empowering to make your own drinks in a group. The ladies took out their pieces of embroidery from the box and set to work. Liza, a very charismatic volunteer, explained that the ladies were making covers for their holy book. They were beautiful and I hastily looked in awe at some example stitches in a specially created book. Before I knew it Liza had got me started and I was happily sewing away. Liza told stories about her wedding anniversary and I found myself laughing heartily with all the ladies. Syeda had brought food for everyone and was spooning it into bowls. Learning new things, laughing and now dinner, I forgot for a minute that I was volunteering. I guess because I hadn’t much time to spend with each of my volunteering roles because I was trying a new one every week I had forgotten an important part of volunteering and that is the skills you learn and the connections you make. I had volunteered for a head injury charity and used to spend Thursday morning playing Scrabble and other board games. I had such a lovely time with people that it felt that I was benefiting just as much as the people attending the group. This felt the same. It was nice to laugh and have fun. I felt at home here. There was something really wonderful about being with other women and I felt that this was a very warm and welcoming group. Liza was a very inspiring woman mixing bringing up a family with her own businesses, studies and volunteering. She wasn’t afraid to try something new; a woman after my own heart. I made an agreement with the lady sat next to me that I would speak English and she would speak Bangla so we could learn from each other. The lady said she would prefer to practice her English and we spoke together for a while as we stitched. In return for my chat she helped me with my sewing. I still don’t know any Bangla. Before we knew it the time had flown by and it was time to finish. The group said goodbye and left. As I cleared away after the group I wasn’t sure if I had been anything more than a group member. Hasina said that I had. My presence had meant that the ladies heard and spoke English which they may not have done if I wasn’t there. I felt even more proud of myself. A lovely afternoon and helpful; I had done well. Hasina said the group was not just for the Bangladeshi community but the people of Hyde but it had just turned out that way. The funding for the group had run out so the ladies continued it by bringing their own material from home because they valued it. They have tried lots of different crafts and would like to try knitting once they have finished their embroidery. The group is on a Friday afternoon 4.30pm to 6pm at Hyde Community Action. I will be back because I need to finish the handkerchief I started. I was offered henna painting, vegetable samosas and I am pretty sure I have been invited for a health walk. Oh yes and then there is the Bangla I said I’d learn.